The Silicon Valley Toxics Coalition’s latest Solar Scorecard is out, and SunPower earned the highest score of any solar panel manufacturer for the second year in a row. Here’s how our industry-leading innovations enable us to build and recycle the world’s most sustainable solar panels. We’re used to recycling common household goods such as paper, plastic and glass, but what about rooftop solar panels? While you may know that the clean energy that solar panels produce is a force for combating climate change, you might not realize that solar’s sustainability potential doesn’t start or stop at the rooftop. Like many products, solar panels have a lifecycle that starts with their design and manufacturing and continues long after their useful lifespan. SunPower takes a regenerative approach to product development and looks for opportunities to minimize environmental and societal impact at every stage of the lifecycle. We’re proud that this thoughtful approach has earned us the top score on the Silicon Valley Toxics Coalition’s (SVTC) 2016-17 Solar Scorecard. SunPower® solar homeowners and businesses alike can rest assured that their panels are being made in the most sustainable way possible. ”With the PV industry’s unprecedented growth, it’s critical that our mission be to take action to ensure healthy communities and quality products,” said Sheila Davis, CEO of SVTC. “It’s great to see SunPower providing an example of how to walk the talk within the green technology world." The Solar Scorecard is a comprehensive rating of solar manufacturers’ performance in protecting workers, communities and the environment. It assesses factors such as emissions reduction, materials usage, working conditions and commitment to recycling. 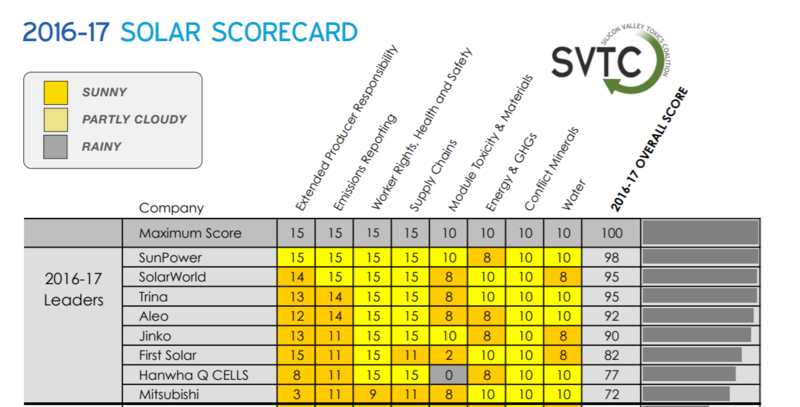 This is the second consecutive scorecard where SunPower was ranked No. 1 — putting us atop a list of 35 companies. We scored a 98 out of a possible 100 points. SunPower institutes a variety of practices in research, development and manufacturing to make sure that all resources used are used minimally and thoughtfully. For example, techniques deployed in our new Silicon Valley Research Facility have cut down on water usage and amount of electricity needed to produce cells and panels. All these efforts and more, both by SunPower and other leading sustainable companies, aim to create quality products and goods that consumers can feel good about supporting. While we are proud of this ranking and achievement, we view the Solar Scorecard not as an award but rather as a benchmarking tool. It helps us understand what we are doing right and what we need to improve. It also encourages us to have an ongoing dialogue with SVTC and other stakeholders to help guide SunPower’s sustainability strategy. SunPower has long envisioned a landfill-free future. Updates to SunPower’s sustainability initiatives since the 2015 Solar Scorecard include developing industrywide solutions for recycling PV cells at the end of their useful life. As chair of SEIA’s PV recycling working group, we are building a national network of collection points and vendors who can responsibly recycle solar panels. Going a step further, we are also collaborating with partners to build capabilities that will ensure materials collected for recycling can be reused as long as possible. This complements SunPower’s commitment to being a leader in a circular economy. PV cell recycling is a key focus area of the Solar Scorecard, as SVTC has been a leader in encouraging electronics manufacturers to take lifecycle responsibility for their products. Other sustainability achievements reflected in our 2016-17 Scorecard ranking include our Mexicali, Mexico, plant becoming SunPower’s first “triple-certified” manufacturing facility. This means the plant has earned three of the industry’s most stringent sustainability certifications: The direct current E-Series and X-Series solar panels it manufactures are Cradle to Cradle Certified™ Silver; and the facility holds LEED Gold® certification from the U.S. Green Building Council and Landfill-Free Verification from NSF Sustainability. SunPower is the world’s first and only solar company to earn the prestigious Cradle to Cradle Certified Silver designation. Products that receive this recognition from the Cradle to Cradle Products Innovation Institute, are ranked against strict standards in material health, material reuse, renewable energy use, water stewardship and social fairness. We also published our first Declare label for E-Series and X-series direct current panels. Declare, administered by the International Living Future Institute, provides solar customers with details such as where the product is assembled, life expectancy and end-of-life options. We are working toward obtaining a Cradle to Cradle Certified Silver designation for our P-Series panels in 2018. We look forward to working with organizations like the SVTC as we pursue this and other initiatives to make our solar panels as sustainable as the clean energy they produce. 1 "SunPower Module 40-Year Useful Life," SunPower white paper. 2013. Useful life is 99 out of 100 panels operating at more than 70% of rated power. Cradle to Cradle Certified™ is a certification mark licensed by the Cradle to Cradle Products Innovation Institute.